I haven’t sketched anything in a while, so I thought I’ll start with what is right on my desk… it were four bottles of ink. I like the darker colors and I don’t only use them in my pens, but also paint and sketch with them. For this sketch for instance I have applied the ink right out of the bottle using a middle sized brush. I’ve had it happen a few times, that readers of this blog contacted me to ask me where they can get nibs and and/or ink erasers. Tough question, I know of only a few stores within the US that carry Lamys, but none where you could by the erasers. So those of you who really want an ink eraser/eradicator and a special nib (only steel!) and who do not fear the high shipping costs from the EU to the US (around 10$) just contact me. I cannot promise that I will be able to get the nib you want, but I will try. It’s January 4th, so usually by that time most people have already broken up with at least one of their new year’s resolutions. I haven’t even made any until today. So my resolution is going to be that I will try to fill at least one page of my sketchbook with a painting/drawing and write about it. It was sketched with a dip pen using tangerine, purple and blue ink. Afterwards I gave it a little wash with the brush. I love using inks for washings or even as watercolor. True, they are not removable once dry, but there color is so much more vibrant than watercolor. Happy New Year to all the reader of my blog :)! No, I’m not referring to today’s weather (which has been rather sticky by the way ), but to these three …eh.. two and a half peppers. I am aware, that they are to be considered spice and probably not food in general, but hey, at least they don’t contain any calories. Well, they actually do have some calories, too, but I’m sure that no one can eat as much of that stuff, that he/she will ever get serious weight problems because of them. So, this is day number 10 and there are still 21 days more to go. As it so happens, my sketchbook still has about 20 free pages, too, meaning that I should finally have finished my first sketchbook by the end of this month! Yay to NaBloPoMo! I hardly can believe that I posted something food related on a daily basis for more than a week now. Wow, that’s not me, I’m feeling scared :-p.
And I noticed as well that I have a strange tendency towards unhealthy food. 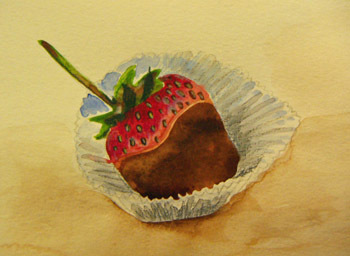 So here is some more calories this time disguised in the form of a strawberry that had been dipped in chocolate. It’s not that I’m enjoying eating that kind of food more, I’m just convinced that calories and cholesterol make better paintings (or as in this case: better doodles). Really! “Trust in me”… as Kaa would have said ;). 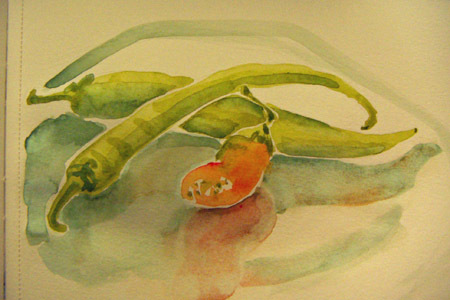 You are currently browsing the sketchbook category at : silviasblog.com :.